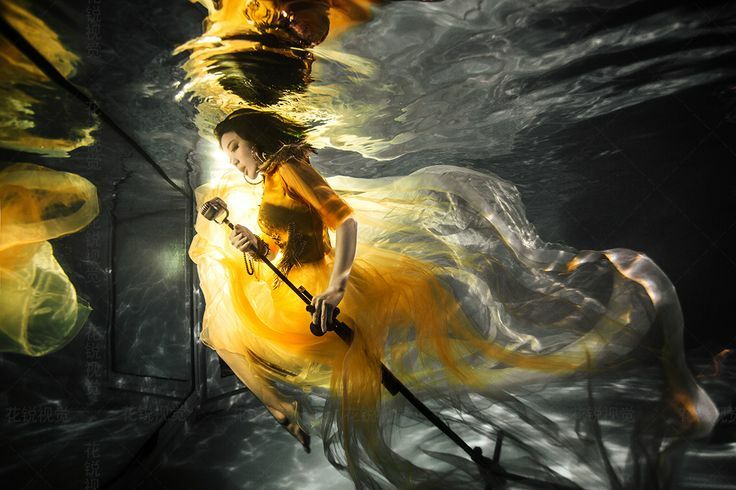 Ma Qirui proves that shooting underwater not only produces amazing photography, but the lengths needed to work underwater takes on a whole different meaning, to working from home. Ma Qirui, 28 years old, from China, has built her own specially designed swimming pool, where she welcomes a swim (oh and a photo shoot). This may sound glamorous or refreshing (mind the pun!) But Ma Qirui has rigorous routines in place to make her work from home swimming pool experience work to the best of her talents. Qirui goes above and beyond, by always challenging her lungs in holding her breath longer for the shoots. In addition to, doing workouts to achieve optimum body strength while underwater. Furthermore, after long hours in the pool, her beauty regime includes, moisturizing her eyes after work and getting warm with the aid of a heater. Qirui’s clients who want to take the plunge (wow, I love these puns!) also have to spend time finding ways to look relaxed, have their eyes open and pose seamlessly underwater. Not an easy task! Some photo shoots can last up to six hours, with several different costumes to wear. See the absolute softness of the fabric air lifted in the water, with the ripple effect at the top water’s edge and the underneath pool backdrop, this photo is absolutely dreamlike. I love this model/princess like photo. 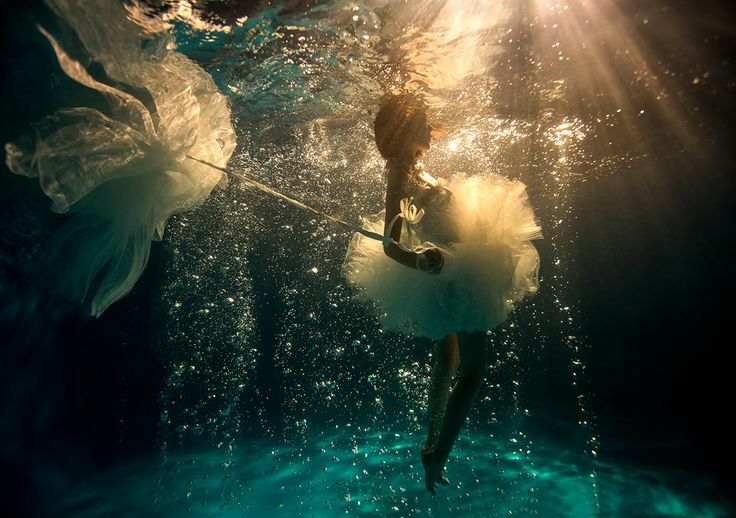 It does make me wonder how the model can wear such a magnificent yet heavy gown in the water. I remember wearing clothes in life saving swimming lessons and I don’t think I looked like this, more like a drowned rat. I also like the props Qirui uses in this photo. Can I also add, that I am quite impressed the model’s make-up isn’t running either? Obviously the photograph overall, is an absolute beauty. Photographers, take note, create a unique picture by using a unique backdrop and simplify the rest to let the photo speak for itself. So many different ways to interpret this photograph. Is the woman swimming to meet her mermaid sister, or perhaps reaching a long lost memory in the sea depths below. Again the simple props of the rose and bubbles underneath capture the essence of such romance and beauty. What better way to draw a fantasy/wishful/wanting dream career into the depths of a fantasy water like scene. The striking yellow gown glowing among the black and white backdrop makes this photograph absolutely striking. Want to be a singer? The best place to sing is in the bathroom, or in this case, underwater. This is just too precious for words. I love the soft flowing prop to match the model’s soft outfit and the bubbles as well as the dark luminous back ground (I mean pool) to create such an amazing, stunning, beautiful photograph. The hardest part about choosing which photographs to feature here of Qirui’s was difficult. I can only imagine how Qirui’s clients feel in choosing their favorites. What I also love about these photographs, is what I feel the photo’s essence is, is what another person might interpret differently. That is what art does when you combine it with fantasy scenery to real model photography. It creates a middle that has you wondering, is this what the photographer intended by the subtleness or was this the true meaning behind the image? Leaving your audience with questions is one way in knowing, you have left a mark on their life with your photography. To me your photography captures the surreal beauty the exists in a single second of time as it would be on dry land. However the flowing intricacies of the model and the wardrobe and water is truly amazing. I can almost feel your photography as I have loved the way water feels around my body all my life. Wish I knew where to look for more.